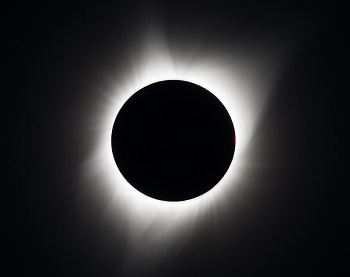 The eclipse video below features several visualizations of the event. From behind the Earth, we see the night sides of both the Earth and Moon and the umbral and penumbral shadow cones projecting from the Moon. We then see the tilted orbit of the Moon and the long, thin shadow cones striking the Earth. In the view from behind the Moon, we see the sunlit far side of the Moon and the western hemisphere of the Earth, and from this vantage point, the outline of the shadow on the Earth is circular.